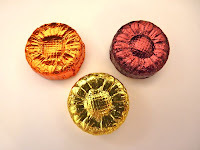 These three lovely flower-shaped, foil-wrapped chocolates from Wei of Chocolate (Phoenix, AZ) were infused with different beverage, spice and floral flavors. These Wei chocolates were labeled organic, vegan, fair trade, gluten and soy free. 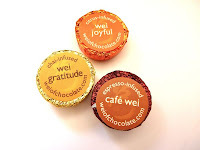 Today was Day #3 of Chocolate Beverage Theme Week.